Dear Doula: What Should I Pack In My Hospital Bag? I am 36 weeks today, so it’s time to pack my bag!! I’ve seen a few lists on Pinterest, but some of the items listed seem unnecessary. Help!! What do I really need in my hospital bag? You know you’ve entered the home stretch when you’re packing. the. bag. How exciting! My best advice when it comes to packing your bag is to always remember The Golden Rule. For everything that is packed, must, indeed, be unpacked. Recovering from the birth of your baby. Falling deeper in love with said baby. giddily unloading all of the extra stuff Pinterest said you needed, but that you never once used. We speak your language. Join the hundreds of clients and students we've helped and get access to our Ultimate Hospital Bag Checklist today. Your Ultimate Hospital Bag Checklist is on its way! How long will I be in the hospital after baby? Most families are discharged within 24-36 hours of vaginal birth. Should baby require additional monitoring or testing, your stay may be extended by 12-24 hours (or up to 1.5-2 days total). If you had a cesarean birth, expect to stay for 3-5 days. Will anyone be staying with me, and who? Does your partner need their own bag, or can you combine? Will they be heading home to shower/refresh periodically or living in the room for the duration of your stay? Will I purchase a Fresh 48 photography session, or photos from the hospital? Hospital pictures aren’t what they were when we were being propped up on pastel backdrops in the 80s. Hospital photographers now offer to take some posed shots in your room before your discharge. A Fresh 48 session can be done any time in the first 48 hours, in the hospital or home, and is more extensive and documentary in style. You should expect to be photographed in both, so consider any clothing or accessories your family may need. What is my birth plan? Do I need anything special to meet my birthing goals? Aiming for a peaceful ambience? You may want to add flameless candles to the list. Expecting some massage? Knuckles are a must. Into essential oils? Pack those, too. Looking for a way to pass the time? Binge-watching Queer Eye on your iPad can certainly do the trick. You get the idea. Don’t get carried away here, though… always remember The Golden Rule (for packing hospital bags). A cute bag is *always* a must. 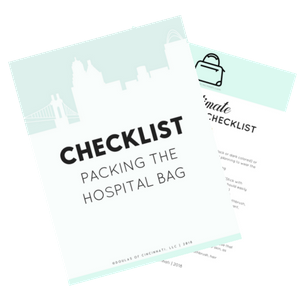 Treat yourself to a gorgeous weekender and use The Ultimate Hospital Bag Checklist (you can download it for free) to make sure you don’t overfill it.